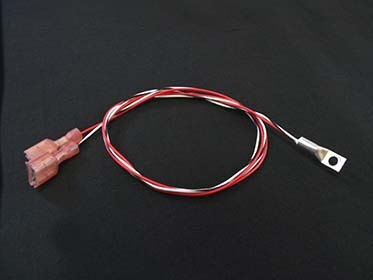 Description: A standard lug-mounted thermistor with 24 gauge wire and “Fast-On” terminals for use with the TC-24-10 controller. 15K ohms at 25 °C, for measuring from -20 °C to +100 °C. 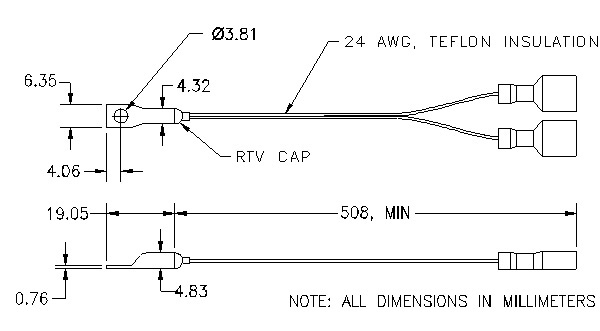 A standard lug-mounted thermistor, 15K ohms at @ 25 °C (TS-67/ 15K-1 curve). Wire is 24 gauge stranded, overall length is 527 mm. This sensor this is essentially a 4.8 mm diameter aluminum tube that has been flattened at one end with a mounting hole placed in the flattened section. 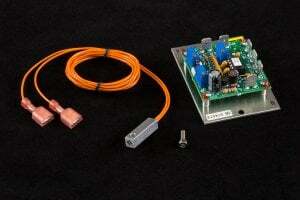 The wires are terminated with 0.25 inch female “Fast-On” terminals for use with the TC-24-10 controller.